Mountain gorillas are the largest living primates and the world’s most endangered apes with an estimated population of just over 1,000 left in the wild of the whole world and none in zoos. The Mountain Gorilla (Gorilla gorilla beringei), was not yet known to the scientist until 1902. They are the next closest living relatives to human beings after the two chimpanzee species, sharing 97% DNA with us. They are vigorously built, with long muscular arms, a massive chest with broad hands and feet. Mountain Gorillas are the hairiest and darkest race of gorillas; the long, thick black hair insulate them from the cold of living at high elevations. Gorillas sometimes walk bipedally for short distances while carrying food or in defensive situations. Very are shy, social animals and very active during the day. They live in families of 7-28 members with one leading male (The Silver Back), accompanied by several females with their young. These apes have high social qualities and relationships within the family. They express their feelings, varying from loving and hating to shame and jealousy, by at least 20 distinct vocalisations, each with a different meaning, besides beating on the chests or on the ground which is their most common form of communication. Beating the ground and the chest is mainly done by the silverback with intent to show power and to intimidate others. Aggression is uncommon among gorilla families. Despite their impressive looks, they are incredibly gentle and peace-loving. In case of danger, they stand up for each other and defend the weaker ones. Serious fights might take place when two leaders of different groups meet each other. Very intelligent animals that can form simple gesture sentences and communicate with people. They have a lifespan of 50 years in the wild and reproduce at a very slow speed with a gestation period of approximately 8.5 months and an interval of four years to the next birth. Unfortunately at least 30% do not survive their first year because of diseases and accidents. Baby Gorillas also die when their father dies, and another silverback takes over. This new male often kills all the babies of his predecessor, securing his genes in the posterity. When a baby gorilla is born, it weighs on average 2.5 kg, and at 40 weeks of age, it walks. At the age of 3, it slowly becomes independent. At six years they are about 1.20 meter tall and weigh almost 70 kg. At this age, the female gorilla matures, though they continue gaining weight for the next four years. The male mature at the age of eleven to twelve years, It’ at this stage when their black backs start turning grey hence the name SILVERBACK, at this stage, it is time to leave the parental group. They wander alone or join other males for some time, before attracting females who will join them. In this way, they form their own family. 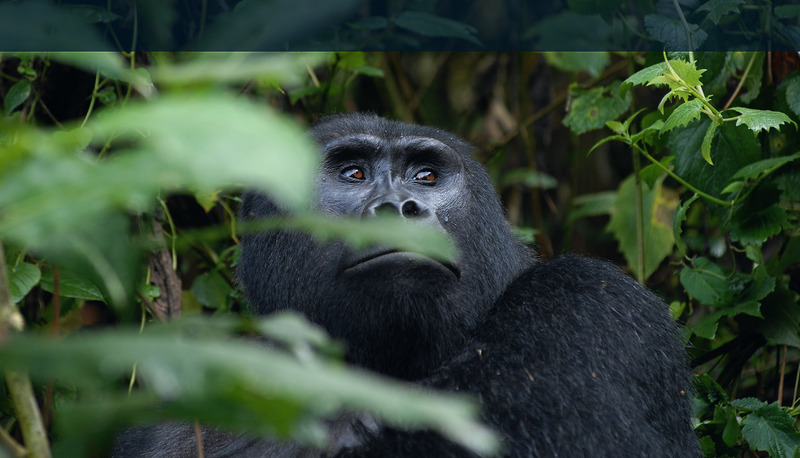 Gorillas are herbivores, eating fruits, herbs, leaves, stems, roots, and shoots. 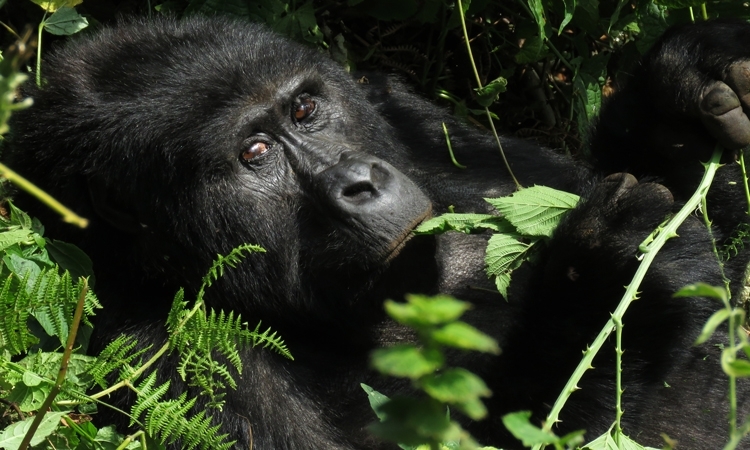 Mountain Gorillas are folivores. Much like other animals that feed on plants and shoots, they sometimes ingest small insects like ants and termites. These gentle giants spend 30% of their day eating. An excellent Silver Back can eat 20 Kilograms (44pounds) a day.